Today we are always on the go and we want the best ceramic dinnerware to be lovely, functional, and dependable to use our time wisely. We crave lovely patterns and designs to go with our home décor, easy to clean, are usable in the microwave and can go into the dishwasher for fast clean up. With so many dinner sets to choose from, find your ideal set in ceramic, ceramic stoneware, glass, and porcelain that have been evaluated for you here. The beautiful and charming Butterfly Meadow® collection is America’s most well-liked and fashionable pattern of flowers and butterflies that conjures up summertime and graceful attractiveness the entire year. 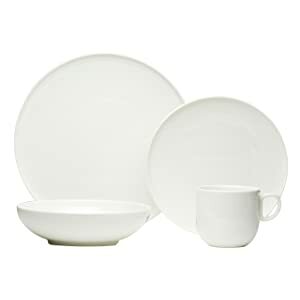 The dinnerware is made of Lenox® white porcelain that resists chipping and is lead-free. We all know that Lenox® has been designing and making quality dinnerware for 125 years. The art is by Louise Le Luyer, designer for Lenox®. You can put these dishes in the freezer then directly in the oven if you need to. They are dishwasher and microwave safe for reheating and resists fading or losing the design. The curved upward unique scalloped shaped edges are so perfect for formal or casual dining and your food will not fall off the plate. Each piece is embellished with nature’s beauty and you can select from 6 different flowers and designs in a variety of colors to harmonize with your décor. The patterns are Blue Butterfly, Dragon Fly, Monarch, Tiger Swallowtail, Fritillary, and Orange Sulphur. 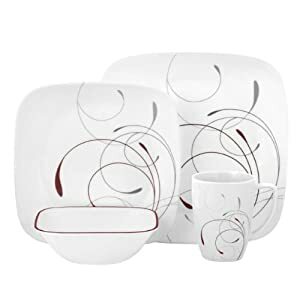 The 28-piece set consists of 4 each 10-3/4-inch dinner plates, 4 each 9-inch salad plates, 4 each 6-3/4-inch fruit or salad bowls, 4 each 6-inch bread or dessert plates, 4-each 12-ounce mugs, 4-each 12-ounce rice bowls, and 4 each 16-ounce cereal or dessert bowls. You can also purchase this in an 18-piece set and a 7-piece pasta and salad set. The back of the dishes have butterflies as well! You can also purchase open stock items of butterfly-shaped platters, larger bowels, teapots, teacups, and more. The durable and versatile dinnerware will last for years to delight your family and friends. Gift-wrapping is available for friends and family as a lovely gift. Included in the box are care instructions. You are guaranteed a Lifetime Breakage Replacement program from Lenox®. The dinnerware is imported from Malaysia and/or China and the set weighs about 24 pounds. The beautiful Corelle® Square™ Splendor 16-piece dinnerware set is trendy for the holidays or any day. The dinnerware is made of Vitrelle® glass. The lustrous dinnerware is a service for 4 with its chic square and rounded corner shape. The rims are flared and the scroll pattern of the Splendor set is a harmonizing red and gray that will fit with your kitchen or dining room décor. Other patterns of floral, simple lines, dots, edge borders, and plain white are available in square and round shapes. 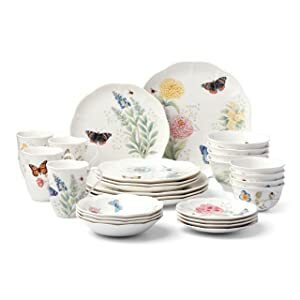 The 16-piece set for 4 includes 4 each 14-inch dinner plates, 8-3/4-inch luncheon plates, 22-ounce cereal, soup, or salad bowls, and 12-ounce porcelain coffee mugs. Matching pieces are available in drinking glasses, trays, and bakeware. 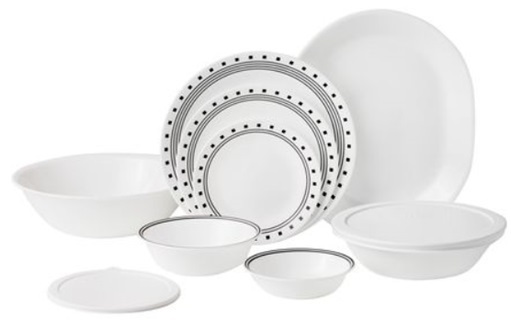 The contemporary dinnerware is safe for the oven and microwave and the pattern will not scratch, wear, or wash off. Be careful with sharp steak knives. The pieces will not chip or break and are durable. The set only ships to the USA and Canada currently. Included in the box are care instructions and a 3-year Limited Warranty except on mugs. Gift-wrapping is available. The dinnerware is made in the USA. The Red Vanilla® brand dinner set is an impressive smooth white surface that goes with any color in your home. Brian Blake is the son of Alf Blake, Mikasa’s high-end fine dinnerware company appealing to discerning and sophisticated consumers. Brian has been creative and farsighted when he founded Red Vanilla® in 2004, providing high-quality products that are cutting edge and high-end design. The dinnerware is classic and timeless with its rounded up edges known as “coupe,” a smooth round bowl or plate having a steep curve up to the rim rather than rims that are flat. Use this beautiful set for your guests everyday or any time you need a simple yet distinctive dinner set. The dinnerware set for 6 includes 6 each coupe 11-inch dinner plates, 8.5-inch salad plates, 7.75-ounce soup, or cereal bowls that hold 30-ounces, and 12-ounce mugs. The surface is a glazed finish rather than a dull matte finish. The contemporary style collection is made of China porcelain and is safe to use in a warm oven, in the dishwasher, and in the microwave. Break, chip, and crack resistant, Red Vanilla® states that the set is lead- and cadmium-free. Matching pieces are available for example a centerpiece bowl, a set of 6 rice bowls, a round platter and a 3-piece set of oval platters. Included in the box are care instructions and Red Vanilla® stands by its products 100%. Gift-wrapping is available. The dinnerware is made in Thailand. The Gibson Elite® Springs Pueblo design ceramic Durastone stoneware dinnerware service for 4 is sturdy and striking to look at. The cheerful art deco colors blend well with any home décor to include the desert southwest. The colorful festive patterns liven up your dinner table and people will love it! 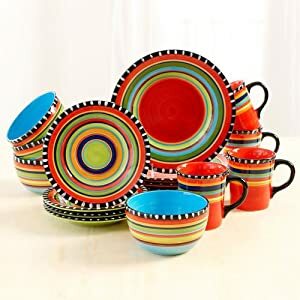 The 16-piece multi-color set is a service for 4 to include 4 each 11-inch dinner plates, 8.25-inch salad, bread or dessert plates, 6-inch soup or cereal bowels, and 17-ounce mugs. The matching 3-piece mixing bowls for displaying fruit are available made of Durastone and gift boxed for your special someone. The cheerful stoneware set is oven, microwave, and dishwasher safe. It does not chip or break and is great for everyday use and for dinner guests. Gift-wrapping is available. Manufacturer’s Warranty can be requested from customer service at Amazon.com®. If the product is damaged upon arrival, please contact immediately to ensure proper processing of replacements. All return requests must be submitted within 15 days from the date of purchase. You must keep receipts, packaging, and the box it came in. You will pay for shipping and handling charges. The Corelle® brand is famous for its beauty and strength. The color name, City Block, item model number 1127103 is available in other patterns and colors including plain white shown on Amazon.com®. The black and white pattern is a contemporary design that is affordable and gorgeous for formal or casual dining and will not wash, wear, or scratch off. The dishes can be stacked in your cupboard. This is one of the best ceramic dinnerware sets to have. No mugs or cups come with the set. 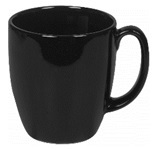 You can buy the Corelle® Livingware™ stoneware 11-ounce black mug that would look stunning with this set here. They also come in red or white. The big mugs are great for coffee, tea, soup, chili, oatmeal, hot cocoa, and more. This is a pack of 6 and you can double that for your 12-piece dinner set. The mugs are 4-1/2-inches tall and are microwavable. And of course, they can go into the dishwasher. The mugs are not under Warranty. The Vitrelle® triple layer glass is made and thoroughly quality tested being manufactured with nearly 70% of recycled glass. The design pigments used are food safe and FDA approved. Vitrelle® glass is proudly made in the USA. It is chip and break resistant and stands up to everyday use for many years. The 74 pieces will serve 12. You will receive 12 each of 10-1/4-inch dinner plates; 8-1/2-inch salad/dessert/lunch plates; 6-3/4-inch bread and butter plates; 18-ounce cereal/soup bowls with BPA (bisphenol A)-free lids; and 10-ounce dessert bowls. Serving pieces are included for 2 each 12-1/4-inch platters, 2 each 1-quart serving bowls with lids, and 2 each 2-quart serving bowls. You will also receive BPA-free lids for storing food in the 1-quart serving bowl and the 18-ounce cereal bowls. The lids are refrigerator, freezer, microwave, and top-rack dishwasher safe. 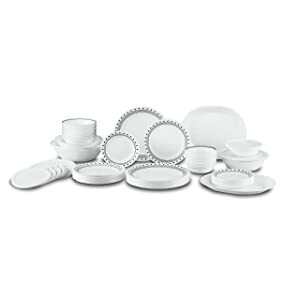 Corelle® City Block 76 Piece Dinnerware Set video. Being nonporous, the set can be washed in the dishwasher. The set can also be used in the microwave and oven. You will receive use and care instructions with a 3-year Warranty on Vitrelle® glass and 2-year Limited Warranty on plastic covers. Corelle® Livingware™ is made in Canada by their parent company, World Kitchen, LLC. The process is the same, the use is different. The procedure in the video is complicated and the hand painting surely takes a steady hand. For holidays, special occasions, birthdays, and everyday use, these are the top 5 best ceramic dinnerware selections evaluated for you. Open stock pieces are available for additional matching of selections of your favorite dinnerware. Happy shopping!